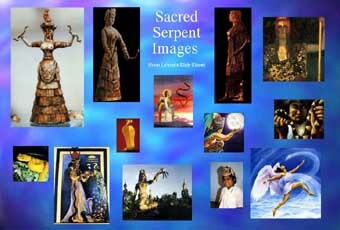 This fascinatingly beautiful slide show contains images of the snake as sacred from antiquities to modern art. In seeing these images, we are reminded that our primal instincts and urges are part of our divinity, not separate. It has only been in the past few thousand years of fundamentalist religious beliefs that the snake has been branded with evil connotations. Yet, in cultures worldwide, the serpent has always been seen as a symbol of healing, regeneration, immortality and wisdom. The Sacred Serpent Slide Show is a delight to behold. Le’ema has been gathering these images for the past several years as research for her upcoming book. Some of the most unique snake images have been contributed by students and friends. It is an exciting work in progress, and continues to grow, becoming both more expansive and inclusive. If you have an interesting image of Snake that would be suitable for this collection please contact Le’ema. Le’ema is available to give talks and showings at bookstores, conferences, workshops, and for special interest groups. If you or your group would like to book an evening with Le’ema and the Sacred Serpent Slide Show please call or email to arrange a date.